At this time every year Farnham benefits from a minor musical miracle in the village of Tilford. The small parish church becomes the focus for a convergence of professional musicians of the highest order. They deliver baroque music, usually including some works by JS Bach, to music lovers who are both local and from afar. There was a welcome at the start of each of the three concerts from the new resident priest, Revd Canon Heather Humphrey. This year was the 62nd festival and comprised a wonderful array of musical delights. The Musical Director, Adrian Butterfield, produced an interesting programme culminating with a superb finale on the Sunday evening. 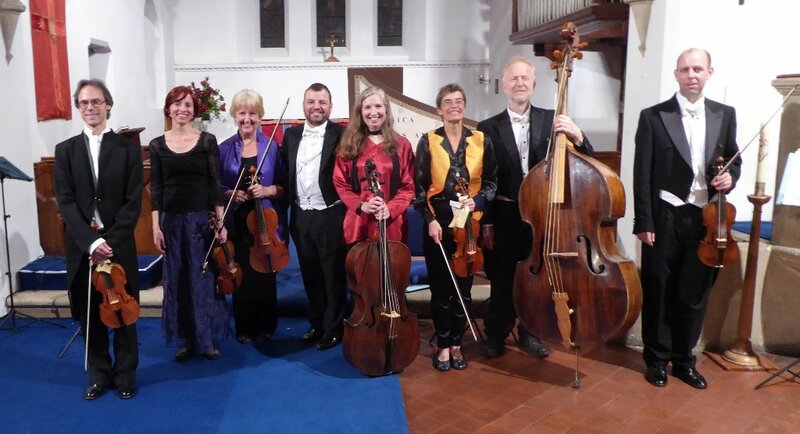 The forecast thunder came early to Tilford last weekend in the form of a mighty storm of applause that followed the Friday concert of the 62nd Tilford Bach Festival. The London Handel Players, directed by violinist Adrian Butterfield, presented ‘The Angel and the Devil’, a programme of works for strings composed in the baroque era and featuring the contrasting styles of the ‘angelic’ Leclair and the ‘devilish’ Locatelli. Appropriately, Locatelli’s Introduzione teatrale provided a fiery, theatrical opening, the nine musicians demonstrating their superb ability to blend perfectly as an ensemble while expressing passion and excitement at breakneck speed. The ‘angelic’ Leclair’s Violin Concerto in A then gave the audience the opportunity to appreciate the ease and elegance of Adrian Butterfield’s playing; breathtaking cadenzas flow from his violin so naturally that it seems to be part of his anatomy. More ‘devilish’ Locatelli came next, a concerto for four violins with an enchanting finale where the players seem to tease one another like playful children. Part Two brought the ever-popular Vivaldi Double violin concerto and an unaccompanied Leclair Sonata for two violins, giving Claire Salaman and Sophie Barber the chance to shine. To conclude, Oliver Webber joined Adrian in a moving performance of the most sublime instrumental work J. S. Bach ever wrote, his Concerto for 2 Violins in D minor.